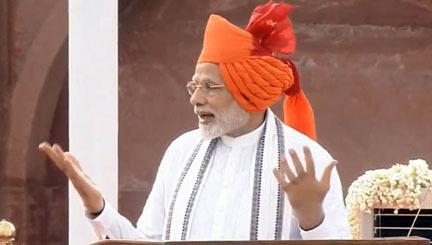 Prime Minister Narendra Modi in his Independence Day address to the nation from the Red Fort in New Delhi on Wednesday said the initiatives taken by his Government have brought northeastern region closer to Delhi. Modi, while speaking on the occasion of the nation’s 72nd Independence Day, said the northeastern region was witnessing multi-faceted development during the tenure of the National Democratic Alliance (NDA) Government. Modi also claimed that new job opportunities have been created and educational institutes are coming up in the Northeast. As per the report, the PM also said personnel of army, paramilitary forces, police and intelligence agencies work very hard to ensure a peaceful internal security situation and there had been a very significant improvement in the situation in the Northeast. While referring to the Armed Forces Special Powers Act (AFSPA), the PM said that it has been removed from Tripura and Meghalaya and also from several districts of Arunachal Pradesh.